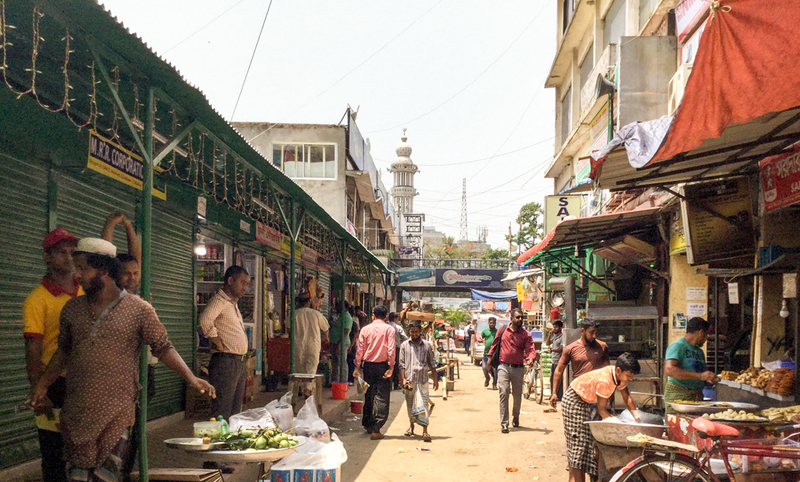 A bustling street in South Asia, home to some of the most gospel-poor peoples in the world. S & I serve with their three children in South Asia, where S has found himself as Managing Director and Acting Principal at a school for expatriate and local children. While this was not his plan when their family began this term of service, S explains how the Father has been graciously using him in this unlikely role to support local believers and witness to those around him. My hope at the beginning of this term of service was to focus on English teaching to students to facilitate evangelism and discipleship at a centre I set up close to multiple universities. It started well, with a few reasonable classes of students and some exciting conversation clubs, but it didn’t last too long. A terrorist attack in our suburb targeting foreigners, including local private university students, led to heightened security considerations that put us on hold for a few months. This led to less students, less foreigners to help and mounting costs to keep the centre. I moved at that time to a mixed model, working with an American friend running a hospitality-connected business to teach English, biblical values and management skills to employees, while continuing English classes in the afternoon. I still had the same goal of reaching university students, many of whom made up the 150+ local employees at my friend’s business. I have been on a journey of trusting the Father that my ‘exile’ into being more of a full-time businessman rather than a sort of bi-vocational student worker in South Asia is good. But once again, that model didn’t last too long. Our children’s school suffered financially, with a 50 per cent loss of students following the terrorist incident. Losing the school, even just the secondary campus, would have meant that we needed to leave the country, along with our American friends running the business. As pretty much the last option standing, I took on the role of Managing Director of the company that ran the school. Then when the Principal resigned due to the crisis, I took up the role of Acting Principal. Needless to say, I found myself busy and with little time to do the ‘ministry’ that I had come to do—or so I thought! Just as Jeremiah encouraged the Babylonian exiles to submit to the Father’s purpose in their unwanted captivity by settling in and making the most of life and work there (Jeremiah 29), so I have been on a journey of trusting the Father that my ‘exile’ into being more of a full-time businessman rather than a sort of bi-vocational student worker in South Asia is good—perhaps might even be better in terms of spiritual impact in relationships with nationals. Our children’s school has 200 students now (still short of the 235 prior to the terrorist incident a couple of years ago), 18 expat teachers, 75 full-time national staff and 20 part-time national staff. It’s a bulky operation for so few students, however it has remained self-sufficient and even made a small profit for the last 20 years. But there are still always a lot of things to attend to as our location doesn’t rank well for ease of doing business. I’ve found myself in the middle of it all as Managing Director and Acting Principal in a culture where hierarchy is important and retribution is scathing, so nobody likes making decisions. What does servant leadership look like in this situation? How do I handle the seemingly endless conflict situations? On my first day in the role, I had to fire one person for manhandling a student and mediate a meeting between staff who would walk unless there was a meeting held that day! Emails, meetings, decisions, analysis, chairing a board with zero experience. Even though the whole series of events to get to this point was guided by the Father and done in prayerful discussion with my wife, I, and others here, I often wonder if I’ve made a mistake by getting involved in such a committed management role, even one I wouldn’t say I enjoy. But there are things that keep me focussed in serving the Father in this current role. Firstly, I’m called to serve and happy to do what the Father has quite clearly put in front of I and me. Secondly, this role embeds me in a community of national staff and parents from different religious backgrounds (50 per cent majority), leading to some good opportunities for communication of spiritual truth, prayer and modelling of leadership. And thirdly, despite having less time for personal relationships than before, I see the value in being intentionally missional with people in this business/school, as it gives me a very clear identity and role in this creative access country. I think for the believers at our school who are involved in churches as members or leaders, working hard in their midst day-to-day as a Christian brother is actually beneficial for the long-term. I don’t yet have a Bible study with them, but I do pray with them and share what the word is teaching me. The model for workers here is usually bi-vocational, so being committed in this kind of role shows our national staff what this looks like and what it means to keep Jesus central in the whole of our lives. It has also been encouraging to see Christian staff living out their faith in the workplace. Our administration manager is a believer married to a man of the majority faith. I have watched her grow in confidence overseeing 50 staff, and acting with grace and compassion amongst them. Our school accountant is also a believer, who has started breaking with cultural norms to tell me whenever he has made a mistake. He now encourages others to do the same, since he knows that I find bad news known early to be good news. He’s a leader in his local church and I trust that the work environment of the school helps him to lead with greater integrity. Part of my role has also been setting up policies that make decisions more transparent and establishing a set of core values to guide them—faith, collaboration, excellence and service. In a recent difficult situation which proved to be good for our school community, I was forced to fire an office assistant and fellow believer for deceptively using the school in personal loan applications. It was hard to do this since he’d been with the school for 21 years, but he has now become debt-free and is making wiser choices. The other staff are also more relaxed knowing that there are boundaries that will be acted on and that the culture of loans amongst staff is not encouraged. The business side of providing jobs within the context of a Christian school is something that is a good presence in our city, not only for the workers who send their children here, but also for those who hear the good news for the first time and as meaningful work for our national employees. It has been a privilege to pray with staff for the loss of loved ones, sick children, lost phones, in disciplinary meetings or when responsibilities change. 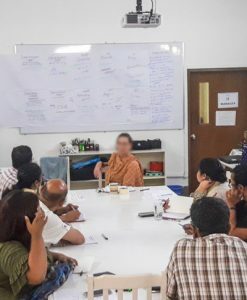 It has also been a joy to host the national staff meetings and the ‘sacred’ staff picnic day, share from the word in the local language, and give staff the chance to share their ideas in small groups with those from all different levels of the organisation. Outside the staff, I get the opportunity to meet parents from the majority faith and share the truth with them. Some of these parents are business owners, property owners and members of senior government families, and I would love to see them become Philemons and Lydias. While my experience on location this term has certainly not been what I expected, nor how I thought God should be using me, I’m thankful and trusting that this is a good thing to be doing. When I read that Jesus Christ is supreme over everything (Ephesians 1:22, Colossians 1:18–20), I’m encouraged that this includes the business work I’m involved in. It is not outside his control, and in our creative access country, it is actually a good way to see the gospel grow and bear fruit. As you pray for the people in our location, I trust that the greatness of our God in ordering things like our current term of service will strengthen your faith and joy in what he is doing. 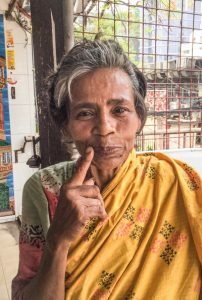 It is not uncommon for missionaries to find themselves serving in unexpected ways in their locations, as God chooses to use them for his good plans and purposes. Please pray that missionaries like S would continue to praise and trust the Father in all circumstances, and seek to serve him in word and deed wherever he places them. Pray that opportunities to become embedded in local communities would lead to gospel witness and encouragement for local believers.